Thanksgiving is just around the corner and this year, we plan to celebrate a traditional American Thanksgiving with our 4-year son. Little G has attended pre-school and he came home one day and asked about Thanksgiving. We know it’s time we immerse himself to the American culture, as well as preserving our native Chinese and Malaysian culture. We wanted to raise him as a global citizen, one who is culturally sensitive and open-minded, and we wanted to celebrate as many festivities and traditions with him as possible. So, that means I have been trying out different Thanksgiving recipes in my kitchen. One of the recipes that I have always wanted to attempt is dinner rolls, homemade dinner rolls. I have tried homemade rolls at a friend’s home and they are just not the same as those frozen ones or ready-made rolls at the stores. Talking about rolls, I am partial to the beautiful looking cloverleaf rolls. I love it that they are shaped like a leaf and there is the pull-apart factor. Three little leaf-shaped rolls all joined together and ready to be pulled apart at meal time. For these honey butter cloverleaf rolls, I turned to Brown Eyed Baker, she learned the recipe from Cook’s Illustrated Holiday Baking 2012. I gathered the ingredients and actually spent time to make the rolls. My son loves the combination of honey butter so I brushed the honey butter mixture on top of the cloverleaf rolls when they were out of the oven. The end results were these glossy, shiny, sweet, buttery, and adorable looking cloverleaf rolls. This Thanksgiving, if you are making dinner rolls for the family, do try out this recipe. Instead of regular dinner rolls, make them into cloverleaf rolls. Tear the rolls apart and slather more butter on the rolls, or you can just eat them as is, with honey butter already coated on top of the rolls. Either way, you can’t go wrong with this amazing honey butter cloverleaf rolls recipe. Honey Butter Cloverleaf Rolls – soft, buttery, and sweet pull-apart cloverleaf rolls. 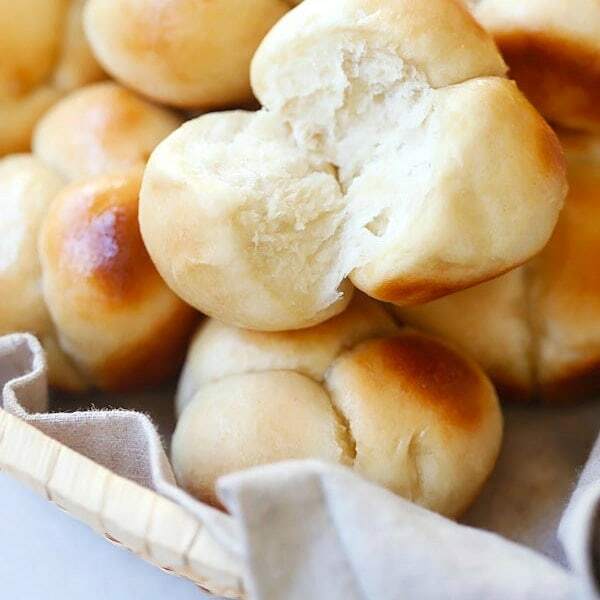 Amazing homemade rolls that is perfect for family dinners. Whisk together the milk, sugar and yeast in a small bowl or liquid measuring cup, then whisk in the egg and egg yolk to combine. Turn the dough out onto a lightly floured surface and knead briefly to form a smooth ball. The dough might appear slightly sticky, but resist adding more flour while you are kneading. 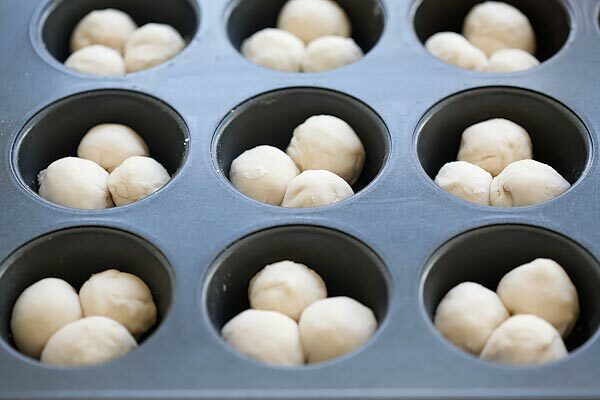 Transfer the dough to an oiled bowl and turn it so that the ball of dough is evenly coated in oil. Cover with plastic wrap and place in a warm, draft-free area until it has doubled in size, about 45 minutes. Brush a 12-cup muffin tin with 1 tablespoon of the melted butter. Punch down the dough on a lightly floured work surface. Divide the dough into 36 equal pieces. (The easiest way to do this is by weighing them out on a kitchen scale, but you could also divide the dough into thirds, then roll each one out into an 18-inch rope and then cut each rope into 12 equal pieces). On a clean surface, roll each piece into a smooth ball. Place 3 balls, seam side down, in each muffin cup. Cover the muffin tin loosely with plastic wrap and let rest in a warm, draft-free area until doubled in size, about 20 minutes. Remove the plastic wrap from the rolls. Bake the rolls until golden brown, about 15 minutes, rotating the pan halfway through baking. 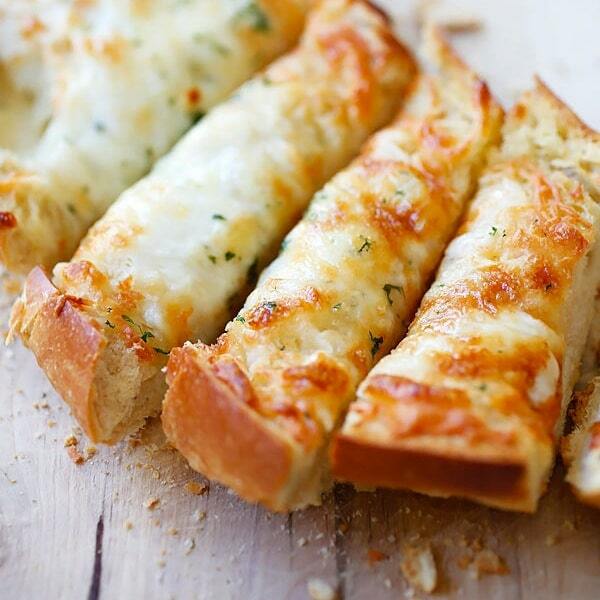 Mix the remaining 1 tablespoon melted butter with the honey, and brush on the surface of the rolls. Serve warm. Do not substitute 1%, 2% or whole milk for the skim milk in the recipe. Same question as above – why skim? We only buy whole milk and prefer not to buy a whole gallon for a recipe. Thanks! Hi Mandy, I just followed the recipe, you can use full milk I think it should be OK. I used 1% milk and it was fine. These cloverleaf rolls are looking so yummy and shaped beautiful as well.Its amazing that we can make it at home,assuring that they are healthy enough for kids. Thanks for the tasty idea. Thanks Michael for your comment. I am sure the kids would love these honey butter cloverleaf rolls. If I were going to make the rules 24 hours ahead, do I let them rise for 20 minutes first and then cover them and put them in the fridge? Made these today and it was an epic fail, followed the recipe perfectly and the dough was nothing but a wet, slimy buttery mess. A waste of yeast and butter, even adding tons of extra flour didn’t help any. disappointing, went back to my original roll plan though so we’d still have some rolls for the feast. Hi Susan, sorry for the late response I am not sure what went wrong but I didn’t have a problem. This recipe is tried and tested by another blogger, too (please see the source of the recipe) and it was good. The original recipe is from Cook’s Illustrated. My dough was also a wet slimmy buttery mess when it was in the mixer. I continued to add more flour, 2 tbsp at a time. After about 6 tbsp, the dough started to pull away cleanly from the bowl. By the time it came out of the mixer, it wasn’t sticky at all and I thought I used too much flour (since the instruction said it should be a little sticky). I didn’t use flour to knead the dough on the counter. Everything worked out well in the end. The buns were delicious and the whole family loved them. The recipe is not showing up for me. What could be the problem? Followed the recipe exactly and the result was magnificent. I am a novice baker and was a little hesitant to attempt, but I couldn’t be happier. 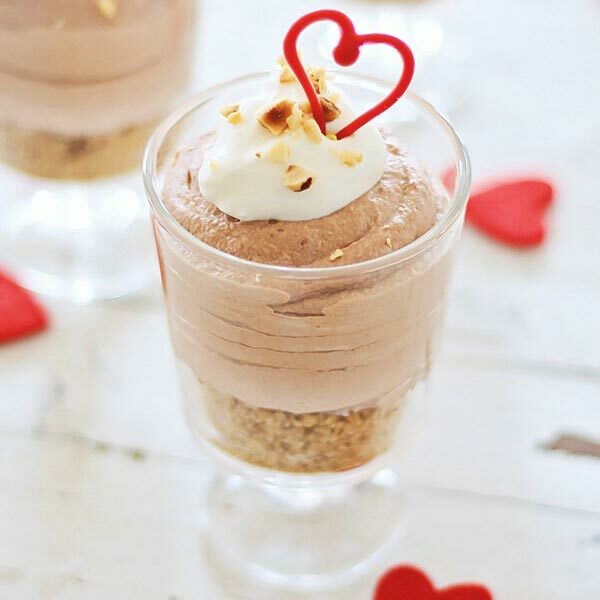 This is hands down the best recipe I have found! I can’t wait to serve these rolls at thanksgiving. Hi Allison, thanks so much for trying my Honey Butter Cloverleaf Rolls recipe. I have no idea. I didn’t weigh. 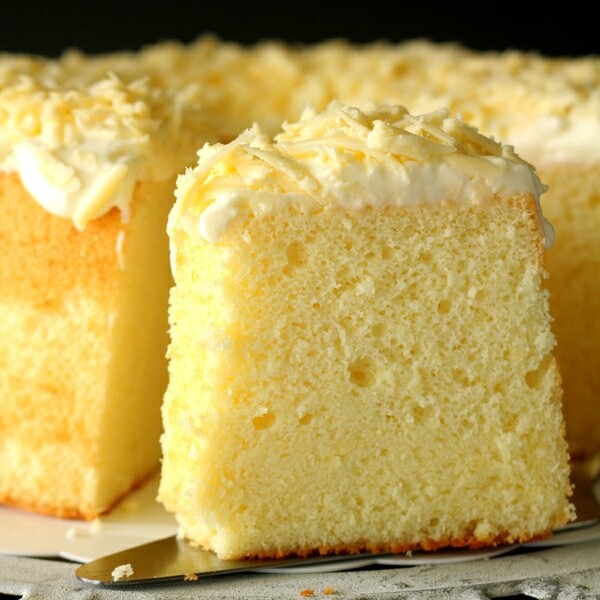 You’re a marvelous human being and have tried many of your recipes. 80% of the time I’m surprised at you explaining the ends and outs of assembling your Asian recipes. I’m assuming you don’t want the yeast added until it has foamed up? It’s not clear so thought I ask.